could make an early get away the next morning. mine for memoir, two for local writers, one for short story and another for poetry. holding up a cardboard sign with my name on it. Was this me? A prize winner or a fraud? They must have it wrong. out of my memory by my tiredness the next day. realised before on the plane to Sydney in a book about compulsions and eating disorders. nourishment, or even for love. survival but also survival of our species. They’re also bound up in pleasure. for years people have struggled to understand what it’s about. it is you have arranged for me. and it pleases me to see things from this angle. behind someone’s refusal to participate and compete. seems like the maddest of behaviours. own success as if I cannot bear to allow it? a few minutes can be overwhelming. Heartfelt congratulations, Elisabeth! Do we get to read it somewhere? 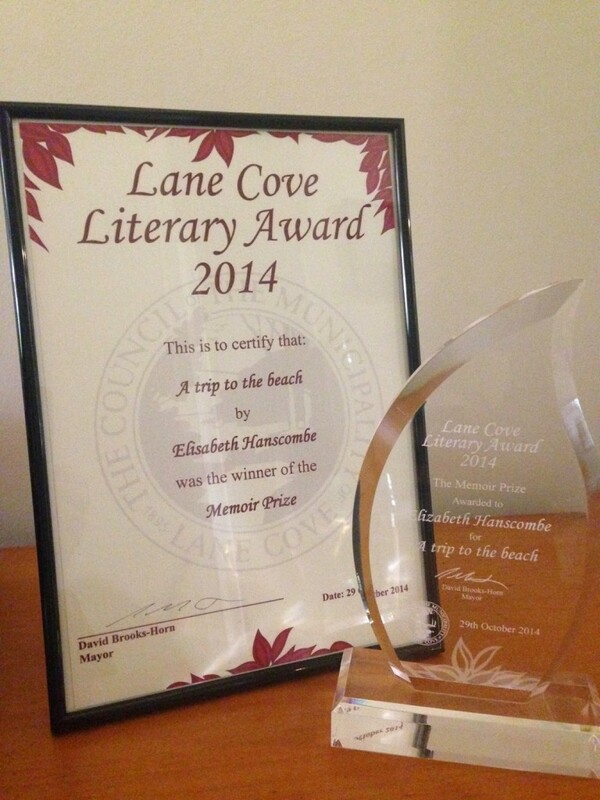 Congratulations, Elisabeth, on an award well-deserved and this particular post demonstrates the qualities of your writing the award committee chose to honor. I'd love to put this story up on my blog, but the folks who organised the competition want to publish it in an anthology later next year. So I shall resist but I'm happy to send it to anyone who wants to read it via email. No surprise to me, and most of the others who look forward to reading your blog; a just award. Well deserved. Your writing is always wonderful. I look forward to your well expressed thought each week. Very well done, Elizabeth. Congratulations from Canada! That "To be on centre stage for more than a few minutes can be overwhelming" suggests to me that you are an introvert. Like many great writers. Blessings and Bear hugs, from another introvert. No, I understand completely. I’m terribly ill-suited to being a writer let alone being anything resembling a successful writer. I don’t like being the centre of attention. It’s one of the reasons I never enter any competitions—at least I haven’t for many years now—because I might win. They would want me to go someplace, meet people, deliver a speech, smile. But I’m pleased for you. Of course I’m pleased for you. It’s the kind of approval friends and family get. Of course you’ve been published in serious journals with serious names; that’s not to be sniffed at either. And all of it feeds our need for approval. I don’t want attention but I never said anything about not wanting approval. Worth is an odd measure. A thing can have a value, a price and a cost but where does worth come into the equation? I don’t like confrontation and what is competition if not a form of confrontation? Thankfully when it comes to writing competitions it’s not as if we have to stand on a platform and face off against our opponents and that’s a good thing. Of course by refusing to compete I’m denying myself, starving myself; because even if I don’t win—and the odds are I won’t—there’s nourishment to be had from the very thought of winning, the possibility of approval. Instead I subsist on comments on blogs and the odd e-mail. A French professor recently asked me to contribute an article to a magazine he runs. I declined—the commitment is too much—but the acknowledgement was proof enough that I was worth asking. Of course I’m worth something to myself. Self-worth. That sum fluctuates quite a bit. To a millionaire two thousand Australian dollars is nothing. To me it’s a big deal. There’re not many people in this world I’d hand over eleven hundred quid too. I paid a plumber just about that this week and a carpet-fitter a few weeks back. That puts $2000 in perspective: a new carpet or a replacement boiler. Then again I pretty much expect both the carpet and the boiler to last until I die—the boiler certainly—so that’s another way of looking at it. Or am I talking now about value as opposed to worth? I’ve no idea if women react differently to men. On the whole I’d say not but I’m generally resistant to underscoring the differences between the sexes. Yes, there are differences but we’re not so different that they make that much difference A fork is no better or worse than a spoon: melt them down and they probably both come to the same amount of metal. I’m writing a review of J.M. Coetzee’s book Elizabeth Costello at the moment and in researching him I discovered an interesting thing: when asked to give speeches what he generally does—at least since 1997—is read a short story featuring a woman, a writer in many way not too dissimilar to Coetzee, who, during the course of the story delivers a lecture. Odd for a man, a great man, a man who not too long ago didn’t just win $2000 and a nice certificate to hang on his wall but was handed a cheque for 10m kronor and a gold medal by the Royal Swedish Academy, to hide (too strong a word?) behind the skirts of a woman like that. Do e-mail me a copy of your entry. Oh wow Elizabeth! Well done girl, it is well deserved and you should indeed be proud of your achievements! Hang that certificate with great pride 🙂 And shout it out!! Congratulations Liz – well done. You're a great writer, why should you not be winning prizes. Lovely news. Congratulations Elizabeth! It's well-deserved and high time to be certain. As a painter who started with little more than a passion to create, I know the excitement, thrill and non-belief which takes over when you're notified you've won recognition for your work. I'm sure every one of us who regularly read your words, is very happy to know YOU'VE MADE IT! Next Next post: Where is she now?